Could the gear shift and clutch save F1? The competitive situation in Formula 1 is so dire right now that a bunch of open-wheel cars turning left 1000 times was more exciting than Monaco. A few weeks ago when I started noting that F1 races were boring, I thought it was an anomaly that would correct itself upon the return to more traditional courses like Barcelona and Monaco. Sadly, that has not materialized. The most exciting moment of the weekend was once again the qualifying sessions on Saturday. When the purpose of the session is running hot laps it’s exciting to watch the times as they’re posted, wondering if someone can best the top time, checking to see if a perennial favourite will somehow be dropped in one of the first two sessions, and who will get the pole position. We know and accept the covenant and for that reason the sessions are exciting. The covenant also states, however, that Sunday is for racing. What we’re seeing instead is just a bunch of cars running hot laps, with nary a chance of passing their opponents. Part of this is due to driver skill. F1 has been extremely proactive in trying to make the cars less easy to drive in the face of technology that is trying to make the cars practically automated. The removal of ABS, traction control and automated starts over the years was meant to give drivers a bigger challenge. Unfortunately, these drivers are so skilled that they are up to the task and barely ever make any mistakes. Let me be clear that by “mistakes” I don’t mean “crashes”: what I would like to see a little more is brakes locking, spin-outs and cars bumping without exploding into a million tiny pieces of carbon fiber, all of which would increase the possibility of passes. Unfortunately, when you’re dealing with cars that go over 300 km/h, asking for more driver mistakes might be condemning more drivers to their death, and clearly that’s not what I’m shooting for here. Perhaps something that should be brought back is the clutch and stick shift. The paddles the drivers use make shifting way too automatic, as confirmed by analyst and former driver Gerhard Berger pointing out on Sunday morning that the cars can shift gears 65x faster than you can blink your eye. Something tells me that he wasn’t exaggerating (he never does). Making the driver have to reach for the clutch with his foot, switch gears and release the clutch adds a “safe” element that could lead to many more mistakes, which in turn could increase the passing opportunities. The drivers might be up this task as well, however. In Indianapolis, which I caught while flipping between it and the Blue Jays telecast, a race was definitely on, with actual passing! Sure they were going in circles, but I can’t fault them for the excitement it generated. 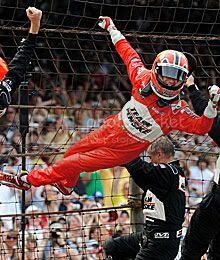 Helio Castroneves was the winner, only a month after he was cleared of tax evasion in Florida (for which he would have served jail time had he been found guilty). It was a perfect story (I heard “Hollywood” a few too many times during the afternoon, mind you), only diminished by the heavy religious angle taken by the broadcasters. As it was becoming clear towards the end that Helio would win the race barring a cataclysm, the pit camera focused on his sister holding a crucifix and praying. That’s fine with me, no harm done there. Where it became a little much was how every time they cut back to that scene, a new family member had joined in the prayer. The tipping point for me was when Eddie Cheever quipped “that’ll get you 10 extra horsepower right there”. No Mr. Cheever, it won’t, as any telemetry readout will indicate. Anyhow, after the race was won the shots of an overwhelmed Castroneves were very touching. Rarely do you see an athlete (don’t go there, not today) display so much emotion, and it was very welcome. He could barely compose himself to speak with pit reporter Jack Arute. Another positive was Danica Patrick’s post-race interview, in which she came off as well as I’ve ever seen her; modest, cheerful, congratulatory – and it all seemed genuine. Hopefully it’s a sign of her finally maturing, because it’s clear she can race with the boys. I thought the ESPN on ABC coverage was very good, especially Scott Goodyear (CANADA!). As noted elsewhere on the web (sorry, can’t find the link), the only problem with the coverage was the gear-head stuff was a little too much. Perhaps that was due to the fact that there were four pit reporters competing for something relevent to say.